ImageDiary, from Chicago-based designer and artist Scottie Kersta-Wilson, is truly wearable art created from images and collages that touch on war and nature and unintented consequences. Rather than using repeated patterns in prints, each piece is a complete composition, possessing a distinct narrative. Each one-of-a-kind and limited-edition silk scarf is a piece of wearable, fine art. 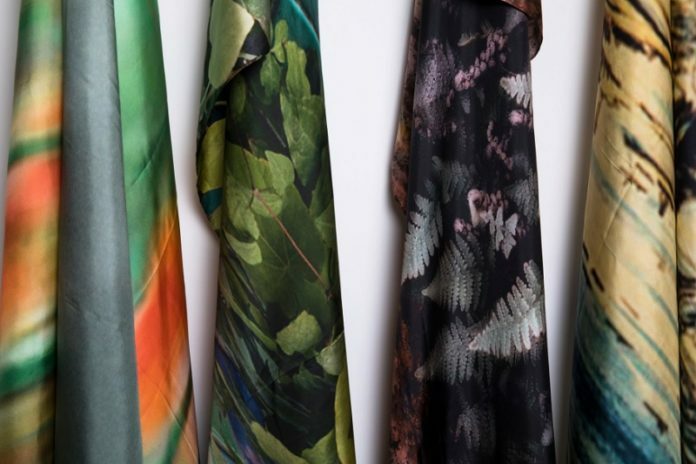 Scottie not only personally creates each piece, but she shares a scarf-tying guide to make your scarf versatile for multiple functions & occasions. A percentage of all Image Diary sale proceeds goes to the non-profit Veterans groups The Telling Project and the National Veterans Art Museum. Meet and shop with Scottie and ImageDiary at the Chicago Artisan Market on Sunday, December 2, 2018 at Morgan MFG, where she will be joined 110+ top artisans in food, fashion, home goods + art. Are objects viewed differently, depending on its form? Each of the ImageDiary pieces tells a story… and is equally compelling whether hanging or worn. But when worn, it brings the story along with you to share. 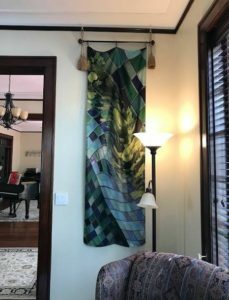 Scottie loves to hear how her clients have multi-purposed the art they’ve purchased. Scottie Kersta-Wilson, a Chicago-based artist and designer, created ImageDiary to tell her story and that of her family. To consider her military and war-filled history feels imperative to who she is. Scottie needed a place to meld her writing and photography, which already felt inseparable. Storytelling, whether in words or images or a combination of both, is how she learns, and it’s a gift she can create and give to others. Most of Scottie’s storytelling is about war – its destruction, beauty, unintended consequences and inevitability. Scottie’s hope is that the storytelling told in fabrics can add something to the tale and take away from the misery.